Bathtub lifts allow people who suffer from limited mobility the chance to enjoy the benefits of a hot, relaxing bath while also enjoying some measure of independence. 1. What is the tub size? 2. What type of seat is needed? The mobility of the person using the seat should be taken into consideration. The seat should be examined to ensure that getting in and out of the bathtub will be a comfortable experience. 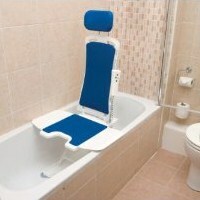 Some bath tub lifts offer flaps on each side of the seat which aid in transferring from a wheelchair to the tub. There are tub lifts that offer rotating seats that swivel around for seating and then swivel back into position for bathing. 3. What is the lift range? Lift range refers to the height that the bathtub lift sits above the tub prior to seating. It also measures how deep into the tub the lift will lower the user. 4. Should a battery-powered lift or an electrical lift be chosen? Many people prefer a battery-powered lift because there is no danger of electrocution or risk of the lift getting tangled in power cables. Others prefer an electrical lift because the chair will always lift in and out of the tub, because there is no need to worry about not being able to get out because the battery has drained. Some companies have now designed bathtub lifts that run on lithium-ion batteries that will not allow the lift to work if there is not enough power to lower and raise the handicap lift for a single usage. Bathtub lifts are easy home mobility aids to install and generally require no extra hardware other than what is included at time of purchase. Handicapped lifts are appropriate for those who suffer from limited mobility due to just about any reason. They are available with detachable hand controls that raise and lift the seat, or with power sticks that raise and lower the seats on command. They are easy to assemble and usually require no tools other than either a Phillips-head or flat-head screwdriver. Prices can range from under $300.00 to well over $1,000.00. Most bath tub lifts are held into place by suction cups and can be installed in under an hour. They are easy to remove from the bathtub when the tub needs to be used by other people in the home. They are easy to clean, store, and maintain. Portable tub lifts also are much cheaper than walkin tubs that require some renovation of a conventional bathroom. If you have a loved one with mobility issues, a quality bathtub lift can give them the gift of a relaxing hot bath anytime they want.